← Weekend Writing Warriors-Dirigibles Are Forever Snippet 3! My friend Gina Storm Grant has a new release. 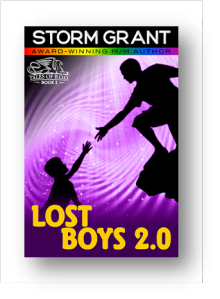 Quirky, funny and mysterious Lost Boys 2.0 is everything you’re looking for. LOST BOYS 2.0:If you can’t join ‘em, beat ‘em. Posted on December 1, 2014, in Uncategorized. Bookmark the permalink. 1 Comment. Thanks for the signal boost. Much appreciated!